With rise of clean energy success stories comes surge of myths, misconceptions. Here's how to counter them. Recent public opinion data from the Yale Program on Climate Communication, publisher of this site, spells out what many have already noticed. More and more Americans accept the science of climate change, are worried about the problem, and say they are on board with efforts to reduce greenhouse emissions. The crux of the conversation has been shifting from whether climate change is happening and why … to what to do about climate change? Bold plans for advancing clean energy initiatives are going prime-time and increasingly part of the national dialog; with that change comes a predictable surge in myths and misconceptions about things like toxic solar panels, dead birds, wasteful subsidies, and more. But by and large, news about clean energy is good news. That’s important because human brains can be reluctant to absorb dire information, one reason acceptance of climate change was painfully slow. With renewable energy, the benefits of less pollution, more jobs, safer energy, and cheaper prices are broadly appealing. Debunking misconceptions is a lot easier when you’ve got facts and optimism on your side. Are renewables affordable without subsidies? Yes, absolutely. The subsidies argument is a common one, and it’s convenient for free-market proponents to suggest that without government help, renewable energy is destined to fail. What’s less convenient, though, is that people who make this argument may overlook the enormous government support for long-established oil, gas, and coal industries. In fact, the American fossil fuel industry receives around $26 billion in direct production subsidies every year, through reductions in tax payments, tax credits for unconventional fossil fuel production, and low-cost leasing of public land for oil and gas production. Take a step farther back and consider some of the indirect support these industries get: The numbers soar into the hundreds of billions per year in the U.S. alone. For example, the price of fossil fuels does not reflect the financial burden of public health impacts from fossil fuel use. In 2012, the World Health Organization estimated there were 3.2 million premature deaths due to outdoor air pollution. Society bears those costs in the form of health care bills, missed work time, and shortened lifespans. It becomes awfully fuzzy to sort out exactly what counts as a subsidy, what passes for an industry favor, and how to account for things like the President’s urging that utilities buy energy from [costly] coal plants that have become too expensive to run. Depending on which variables are considered, estimates of fossil fuel subsidies vary across an order of magnitude. Of course, renewable energy gets government help too, like the Department of Energy Recovery Act Loan Guarantee Program, which spurred investment in American clean energy from 2009 through 2011, and the production tax credit, which is to end this year. The Department of Energy continues to provide loans for energy innovations across many technologies, including renewables and fossil fuels. On a kilowatt-for-kilowatt comparison, using strictly “direct” federal energy subsidies, renewable energy appears to be the main benefactor. However, that analysis sidesteps most of the considerable benefits enjoyed by the fossil fuel interests, such as the loophole in determining the fair market value for coal extracted from public lands, which saves the coal industry upwards of $100 million that would otherwise be paid to the U.S. Treasury and therefore benefit taxpayers. The takeaway message is clear: no form of energy exists without government support, and no industry has gotten more help over the years than the fossil fuel industry. The previous article in this series illustrated that the overall costs of wind and solar are the cheapest forms of energy, even without subsidies. All told, the subsidies argument is one that is easy to craft into a winning response. Is solar energy a dirty energy source? No. Misinformation about the purported toxicity of solar panels is widespread, but this dubious variation of the myth stood out as one that warranted further investigation. In other words, the article equates a cubic meter of used solar panels to a cubic meter of spent nuclear fuel. One needn’t have much of a science background to realize that a used solar panel offers a completely different type of hazard compared to a bundle of uranium and plutonium. Perhaps a more useful unit of measure would consider the type of toxin, the degree of hazard it poses, how long it lasts, and, critically, exposure – that is, how easily it’s transported through the environment and absorbed by humans and other organisms. Volume alone is not a useful measure of toxicity, particularly when it comes to nuclear waste. As clean energy ramps up, the latest wave of fossil fuel dark money seeks to undermine its benefits. Fellow Yale Climate Connections writer Dana Nuccitelli in June 2018 described this situation in the attacks on electric vehicles and solar panels for the Guardian newspaper. That said, of course we want solar panels to be as clean and green as possible. They do contain heavy metals and toxins similar to the materials found in smartphones and laptops. Unlike a smartphone, however, a solar panel has a 25-year lifespan. Solar panels are mostly made of glass, which is easily recycled. The remaining components are plastic, aluminum, silicone, and metals, each with its own pathway for recycling and disposal. The recycling efforts of solar panel manufacturers can be compared using the Solar Scorecard. It’s also worth noting that solar-thermal plants don’t use solar panels at all, they use mirrors. People who make this argument tend to fall into two camps. In some cases, concern for the environmental footprint of solar panels is genuine. But in other cases the underlying motivation is simply to rally support for more polluting forms of energy. Either way, it’s easier to take the comment at face value and point out the environmental virtues of solar energy. As always, start by building off of common ground and aim for a response that appeals rather than offends or repels. Are wind turbines bad for wildlife? On balance, no. One can well mourn the loss of any wildlife killed by our infrastructure, but it’s important to keep the numbers in context. The U.S. Fish and Wildlife Service has a helpful web page showing the scale of bird deaths from various causes. Wind turbines are low on the list of threats to birds. Nonetheless, wind farms need to do their level best to help prevent collisions with wind turbines. 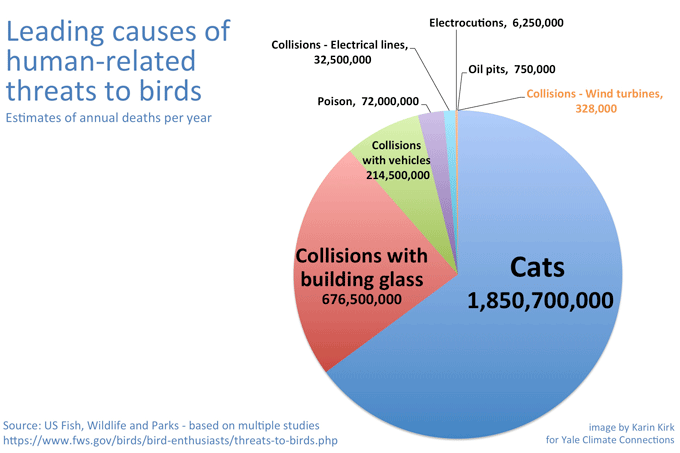 Another angle is to compare bird deaths from wind energy to bird deaths from other energy sources. A 2012 paper by Benjamin Sovacool compared bird mortality from wind energy, nuclear energy, and fossil fuels. Sovacool tabulated bird mortality from power plants, mines, and energy infrastructure, and also threats to species from pollution and climate change. He found wind energy to be the least detrimental to birds, with fossil fuels causing approximately 35 times more bird deaths per unit of energy generated. At last, the climate debate is where it should have been all along, and the conversation about serious carbon cuts is well under way. As renewable energy options scale-up, we can all join dialogues to help maintain the momentum. The virtues of renewable energy are encouraging, and well worth repeating. Editor’s note: This piece was edited on March 19 to correct the mistake that the Department of Energy loan guarantee program had expired.